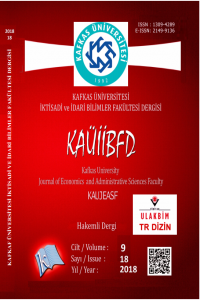 Authors who will send articles to Kafkas University Journal of the Faculty of Economics and Administrative Sciences (KAUJEAS) should pay attention to the article writing rules which are determined in general framework below. 1. Submissions should be prepared using MS Word in size 11 pt Times New Roman, and maximum 25 pages or 7000 words. 3. The title of the manuscript should be written in bold, centered with capital letters, not exceeding 14 pt and 12 words. 5. The author's name, title, university, faculty, and e-mail address should be placed just below the title. 6. The abstracts in Turkish and English, which should be minimum 75 and maximum 150 words in size 10 pt, should be prepared in 1 line spacing including the purpose, scope, method, findings and results of the article. 7. Three keywords directly related to the content of the article should be placed at the end of the abstract. 8. Three JEL codes must be specified under the keywords. 9. Under the JEL codes, the scope (i.e. Business, Economics, Public Administration) and type (i.e. Research, Review) of the search must be specified. 10. On the next page; title, author information, summary, key words, JEL codes, focus and type should be in English. 11. The bibliography should be written in size 10 pt. 12. The submitted article should not have been published elsewhere or should not be reviewed by another journal. Paper that have already been presented can be sent out by extending it and informing this extension in the footnote. 14. Since our journal is a refereed journal, there is a Referee Evaluation System. 15. The articles sent to our journal pass first through the editorial review. After the check spelling, it is scanned in the plagiarism program iThenticate. If there are “extreme direct quotes”, it is requested that the writers correct the article before sending to the referees. Articles with high similarity are rejected by the editor. “Anonymous writer anonymous referee” rule is applied in the peer review process. The articles are sent to at least two specialists in their fields. If the opinions of the two referees are different, the opinion of the editor or third referee is taken. 17. The article submission template is shown in Appendix 1 in link.